If there was ever a word that a physicist dreads hearing in common parlance, it has to be ‘quantum’. Believe me, I think I’ve heard this word abused more than perhaps any other. As such, in this episode of Passionately Curious, back after a long hiatus, we’ll be diving into the how and what of quantum physics for real. No scary equations, no mathematical hocus pocus: just descriptions and analogies, so you too, citizen, can get a general feeling of what all that quantum weirdness is about. To start our journey of understanding1, we travel back in time about two hundred years, to 1805. Thomas Young was doing an interesting bit of science with light. See, at this point it was not actually known what kind of ‘thing’ light really was – was it a tiny, tiny kind of particle? Was it (as the leading theory claimed) some kind of wave? Young decided to put the matter to the test, and devised a clever experiment. It was known from waves in water that if we put a screen in our tub with two vertical slits and create a wave radiating outward, we’ll get two new wave sourcing radiating outward at the other side of the screen at the slits. However, these two waves together create what is known as an interference pattern: where two ‘highs’ or two ‘lows’ meet, they amplify each other, while in between (where a ‘high’ from one source meets a ‘low’ from the other) they will cancel each other out2. Young simply did the same thing but with light, as illustrated below. Had light been a kind of particle, one would have expected two separate bands of light on the screen, each right behind the slit. However, he indeed found an interference pattern of many bands! Like the water in our previous example, the slits became point sources, with waves of light radiating out. As such, it seemed proven: light must indeed be some kind of wave! So far, so good. However, a problem arose about a hundred years later. Our famous friend Albert Einstein had been tinkering with the photoelectric effect­3. What’s relevant to remember here is that an atom is essentially a core of protons and neutrons, with a ‘cloud’ of electrons happily whizzing around it. The electrons are bound to the core with a specific amount of energy: the binding energy. It then (hopefully) makes sense to you that if I give the electron more energy than the binding energy, it will escape the confines of the atom and jump off, not unlike how the moon would leave orbit and zoom away from the earth if we were to speed it up enough. In the photoelectric effect, we achieve this by pointing a light source at our material of choice. The electrons then absorb the light they’re hit by, and take the energy into themselves. At the time Einstein was doing his experiments, it was believed that (like with sound waves), the energy of a wave of light only depended on its intensity – whether the light is bright or dim. However, scientists had recently found that the energy of the electrons jumping out depended only on the frequency of the light, rather than the intensity as they had expected! In fact, no matter how high the intensity of the light, if the frequency was below a certain threshold, nothing simply happened at all! 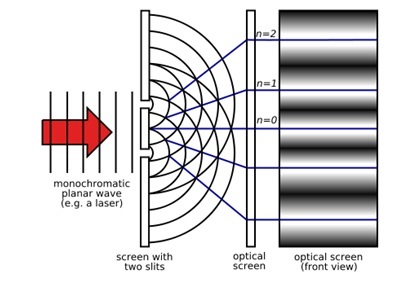 Einstein solved this conundrum by positing that instead of waves, light must be made up of particles that – for reasons following from his research into the photoelectric effect as well as Max Planck’s research into the discreteness of the black body spectrum4 – must have discretely quantized energy5. This, as you might have guessed, is indeed where the word ‘quantum’ originated! Bafflingly, it turned out that light was not just a wave with a continuous energy spectrum, but rather something that wasn’t quite a wave but also wasn’t quite a particle, that had energy that increased in discrete steps as its frequency went up! Initially, the theory of quantized energy was just a description of phenomena without a broader, more rigorous basis – though it did allow scientists to unify all observations regarding light in one theory. However, a few years later the French physicist Louis de Broglie put forth a fascinating theory: what if all matter is, in fact, both a particle and wave? This came forth from another big problem at the time: how the hell do atoms even exist? The problem at hand was that the dominant model describing an atom was the classical one: we have the negative electrons flying in an orbit around the much larger, positively charged, nucleus6. However, we’ve just learned that electrons can take in energy by absorbing light – even at the time, it was well known that the reverse could also happen: electrons could get rid of energy by sending out a photon with some energy. Can you then guess what would happen if we go back to our earth-moon analogy, in the case where the moon could just dump its energy at will? If you guessed that every single electron would just come crashing down onto the core it was spinning around without microseconds, then you got it right. Obviously, since we can observe atoms as having some sort of structure with a large, positive core and happily zooming electrons6, something had to be keeping them from come collapsing. It turns out this realization was a stroke of genius, and if anything is the founding stone of quantum mechanics, it might well be this insight: all matter, no matter what kind, is both a particle and wave at the same time! By analogy with the photon, (the ‘light particle’, if you will) the electron, too, now can only take on discrete values of energy! You might visualize these discrete energy values, or energy states, as being orbits of different sizes around the core of the atom. The electron can jump between orbits by taking in or sending out a photon with energy equal to the energy it takes to ‘jump the gap’. However, once it reaches the smallest orbit, there is nowhere for the electron to go: there is an absolute lowest energy it can take, as there is simply no lower energy allowed to it. If this makes no intuitive sense, know that you are absolutely not alone. However, we’ve only just begun to touch on the true weirdness of the quantum world. After all, there are some more implications to the fact that an electron (and, in fact, all matter) is not just a particle but also a wave. At this point, I’m going to ask you to watch the following 5 minute video https://www.youtube.com/watch?v=Q1YqgPAtzho. It’s (hopefully) a successful summary of what we’ve discussed so far. One thing I’d like to remark here, is that all of these effects have been measured and studied – this isn’t just theory, these are all phenomena observed in nature! However, you may wonder: how the hell does that work, then? How can an electron essentially go through the left slit, the right slit, both slits at the same time, and through neither (but still end up on the other side) all at the same time? Welcome to the wonders of the quantum world, my friend (and I haven’t even gotten to the observing part yet). Still, physicists really wouldn’t be physicists if they had stopped there. Turns out, the best way to describe a particle living in a quantum world (i.e., an isolated particle of a very, very small scale – we’ll be discussing how to resolve quantum effects for larger objects later) is by using what is called a wave function. What the wave function gives us is not a simple equation of motion, like we would use in Newtonian (or: classical), physics, but a complex equation that describes the chance of the electron being in any given position in space at a given time. As long as you aren’t actively observing an electron, it isn’t anywhere – it simply has chance of being somewhere in all of space, with some definite probability. Yes, yes he did. In fact, Einstein was very unhappy with the chain reaction of quantum physics that his and Planck’s discoveries started. In fact, he tried for most of his life to devise an experiment that would succeed in dismantling this new “Physics of Chance” he so despised. The thing is: he, nor anyone else, ever did. Turns out, no matter how weird it might sound, the description of position and momentum in terms of chance proved to be extremely successful, predicting the results of experiments on the quantum scale correctly time and time again. Well, the problem here is that ‘observation’ is typically a very ill-defined term. After all, think for a moment about what it really means to observe something. Let’s start simple: how is it that you see things?8 It’s a pretty devious mechanism, but the gist of it is that light comes in from some source, bounces off an object, and then ends up in your eye. Your retina catches it, and transforms the minute differences in wavelengths into information your brain can deal with. Any physical measurement is similar: there is an interaction between the thing we are measuring and our testing apparatus. The same principle applies when you do a measurement in the quantum world9: you have a macroscopic object interacting with a microscopic object. In the process, the two become interconnected, and as a result the quantum particle now essentially behaves as if it was also a macroscopic object. That is, it now has a definite location in space and all of that jazz – of course, until you set it loose again, where the connection quickly weakens and it regains its quantum properties. Then, finally, why is it that not everything behaves like a quantum particle? I mean, if you think about it, everything is built from particles that, by themselves, act quantum mechanically. Why doesn’t a conglomeration of them act the same? To close on a slightly embarrassing, but also pretty exciting note: we don’t know. There are interpretations, there are theories, yes, but none of them are definitely proven. An elegant way to think of it, I feel, is to realize that wave functions scale with the mass of the particle: a very heavy particle will be less spread out than a very light one. This scaling is exponential, so what happens if we treat ourselves as essentially one massive particle-blob? Exactly: our wave functions become exponentially concentrated on a real point. By this description, there is in fact a small deviation in our location, but it’s so astronomically small (think: “smaller than a billionth of a proton” – small) that it’s essentially zero. To round off this venture into the quantum world, I’ll share one fun realization I once had, though. That’s all I got for this week. Hopefully I’ve managed to give you some understanding of the quantum world and its quirks, and I sincerely hope you’ll never again be intimidated by people sticking the word ‘quantum’ on their products. See you all next time, and remember: stay curious. If this bit didn’t do quite good enough of a job explaining it, I suggest you watch up to 1:30 of this video: https://www.youtube.com/watch?v=Q1YqgPAtzho. Feel free to keep it open, we’ll be viewing the second part of the video later. That is, the energy increases in very small but finite steps – instead of the intuitive expectation, where we can simply take smaller and smaller ‘bites’ of energy. We’ll see later that this is not just the case for light, but also in general: energy (and many other things) come in set quantities, rather than being a continuous spectrum. Or another analogy: rather than a liquid, where you can take any amount, energy comes in boxes of a set size. Note that this is me exercising some slight creative freedom for the sake of reducing complexity somewhat. In fact, the theory of discrete energy levels for electrons was proposed by Ludwig Boltzmann. The discreteness of energy levels was a step in the right direction, and was independently confirmed by observing spectral lines of hydrogen (see: https://en.wikipedia.org/wiki/Spectral_line). De Broglie’s idea was in fact independent of this phenomenon, and he deduced it from the theory of special relativity (the general properties of which I’ve discussed previously here). This is a very clever but very mathematical deduction, and so I’ve decided to resolve it (admittedly, perhaps a tad sloppily) in this way. Alright, I’m going to get weird here a sec for completeness sake (and because you may have actually heard of this before): this is where quantum mechanics gets truly bizarre. The thing is, there is no unanimous agreement in the scientific community exactly how the ‘measurement problem’ should be resolved, and there are in fact several accepted scientific descriptions. I am outlining the most mainstream one here, though there are several other, pretty widely accepted ones. Although with a chance less than 1 divided by a googolplex. Still, that’s a good thing – because the wall doesn’t hamper your quantum chances of being in a different spatial position by much, so you’d have just a good if not greater chance (since you’d have to travel less far) to end up inside of it. This story would hardly end well, I imagine. Previous Previous post: Magazines: the ultimate hand guide for women?